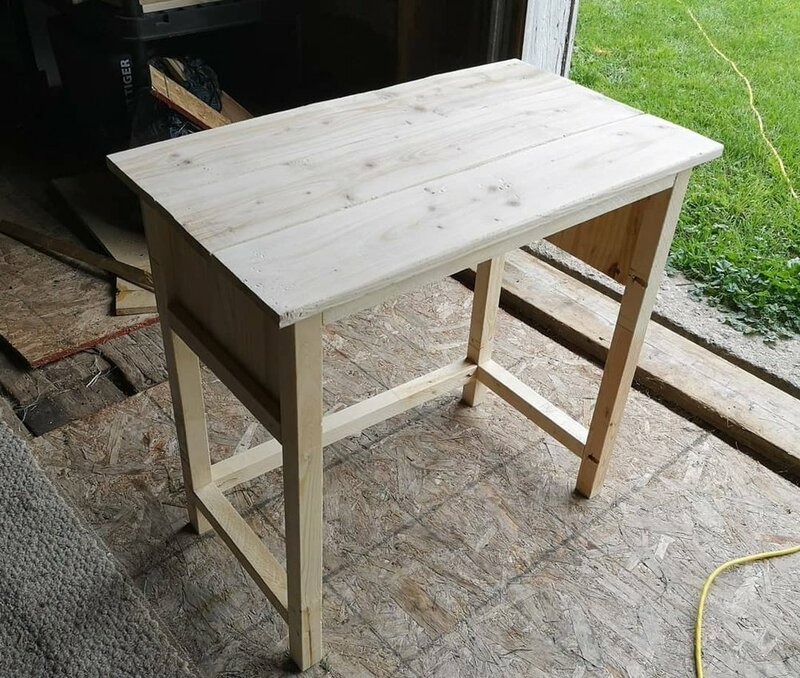 After moving into a new home and finally having a dedicated bedroom space, we decided to make our own nightstands for the bedroom. We had a decent sized room, so we decided on making full size night stands. The nightstands are based on Ana White’s farmhouse nightstand design (check it out here). Using the miter saw to make some cuts. 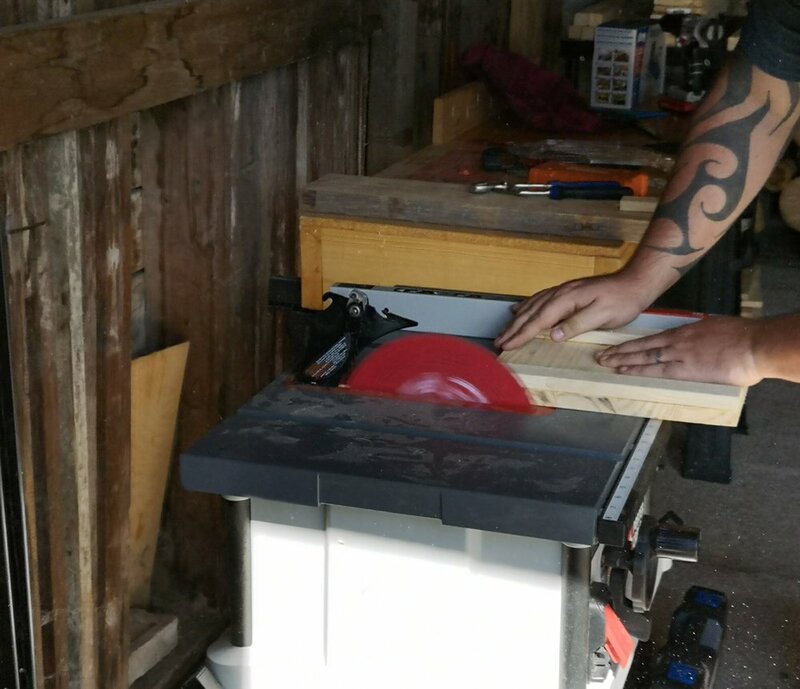 Using the table saw to make the remaining cuts. First order of business was to make the cuts. We used a combination of our table saw and miter saw to complete these. Photo showing the clamp and installation of the screw after the pilot holes were drilled. First step in the build process is to build the side panels of the night stands. You will need both of your 1x12 pieces that were cut to 8 ¾” along with 4 of the 1x2 pieces cut to 11 ½” in length. Glue the backs of the 1x2 piece and clamp it to the matching edge of the 1x12. Let the glue set for a few minutes, then flip the piece over. Grab 2 1” screws, your drill, and a small drill bit (make sure it is smaller than the width of your screw). Mark where your holes should be with a pencil. We placed them approximately 4.5” from the edges and centered in the middle of the 1x2 piece. Make sure to leave enough room to drill pocket holes into these areas for the next step. We drilled pilot holes in the two spots using the drill bit, then installed the screws. After another couple of minutes, we took the clamp off and repeated the steps for the remaining pieces. When you are finished this step, there should be four screws in the back of each side panel. Drilling the pocket holes for the side panels. This is why it is important to ensure your backing screws are installed close enough to the middle so they are not hit on this step. Glue is on and the clamps are holding the pieces together while screws are installed to ensure a tight, square fit. Both sides are done! Any minor imperfections or gaps can be filled in with wood filler and sanded down. Next would be to connect the side panels to the legs and cross support. You will need 2 2x2s cut to 26 ¼” and 1 2x2 cut to 11 ½” for each side panel. Using the Kreg Jig, we drilled the proper sized pocket holes into the thick areas of the side panels (2 per side) and one per side into the cross support. Once all the pieces were ready, we laid them on our work space, determined where glue should go for the connecting pieces, and clamped them together. The cross supports should be placed 3” from the bottom of the legs. Do ensure that everything is lined up square or else your piece will not assemble properly in some later steps. Using the drill and 2 ½” screws, we drilled everything together. Repeat the steps for the other side. Clamped the two sides together, and installing screws in the pocket holes. Once completed, it is time to attach your two sides together! For this step, you will need 4 2x2s cut to 23”. Ensure that there is one pocket hole per end drilled into every piece (2 per piece). 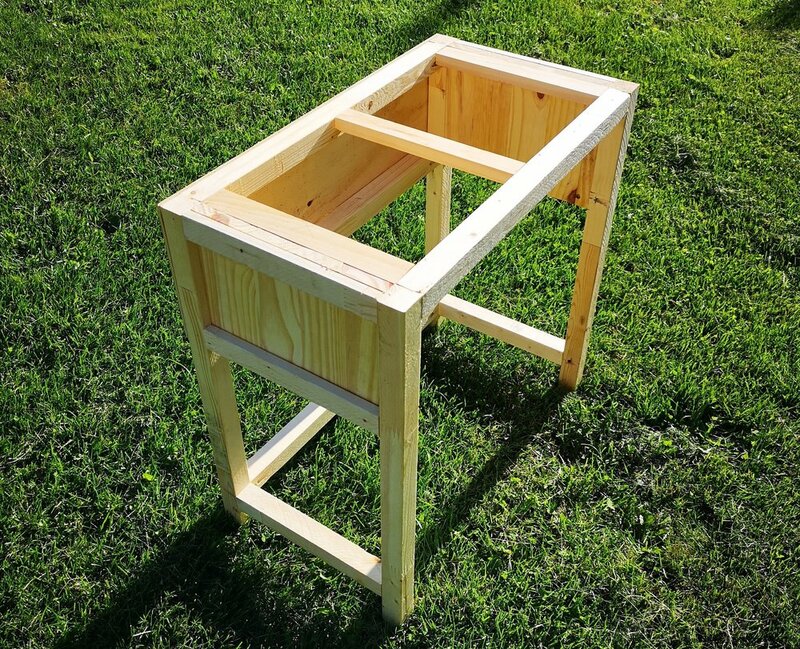 Stand the two side panels and legs from the previous step onto your work space as if the completed nightstand was lying on its back. Place the 2x2 to line up with the top of the panels, the bottom of the panels, and the cross supports along your work space (see photo). Ensure they are square and glue and clamp everything together. Take your 2 ½” screws and join the side panels to the 2x2s. The 4th 2x2 will be to join the front side of the night stand at the top of the side panels. Attach this in the same manner as the others, but make sure the pocket holes are facing “inside” the nightstand so they are hidden. 1/4” plywood panel cut to size, glued and clamped. We used a Brad Nailer to install finish nails. If you do not have a Brad Nailer, you can use 1” screws and attach to the frame. Now you can install your back panel. You will need the ¼” thick plywood piece cut to 26” wide and 8 ½” tall. We dry fitted this piece with clamps to ensure it lined up with the sides and the 2x2s and there was no overhang before we attached. To attach the piece, we put a generous amount of glue in a 1” border around the plywood. Then we lined it up on the back of the nightstand and clamped it into place. We used our Brad Nailer to attach the plywood to the 2x2s with finishing nails. Then left the clamps on for half an hour and removed (the glue that we use recommends clamping for half an hour, follow your glue instructions).If you do not have a Brad Nailer, you can use screws. Ensure you drill pilot holes like you did in your side panel assembly to make the screw installation easier. Attach the top supports with screws through the pocket holes onto the frame. This is what the top supports will look like once installed. Next up are the top supports. You will be installing three supports that will be used to attach your nightstand top to. For this step, you will need 3 1x2 cut to 11 ½”. Drill a pocket hole into each end of the 3 pieces, ensure you adjust your Kreg Jig and drill bit for the new material thickness. Flip your nightstand upside down on your work space. Measure 10 ¾” in from your side panel (or 12 ¼” in from the very outside edge) on both sides and make a mark. Place one support on either side flush up against your side panels and one in the middle lined up with your marks. Use the correct pocket hole screw length to attach the supports to the frame (we used 1 ¼” length screws). The stop was attached by drilling 1” screws down into the top panels through the top supports put in during the previous step. If you are not using pocket holes to attach the top panels together prior to attaching to the table, just make sure you are installing a screw into each panel through the top support. The nightstand once the top was installed. Time to build your top! You will need 3 1x6 pieces at 28” in length. We had cupping problems with our 1x6s the first time around which we fixed just by allowing air to dry out all sides. We were debating using one solid piece for the top, but decided to persevere with the 1x6s as we liked the panel look better for the top. 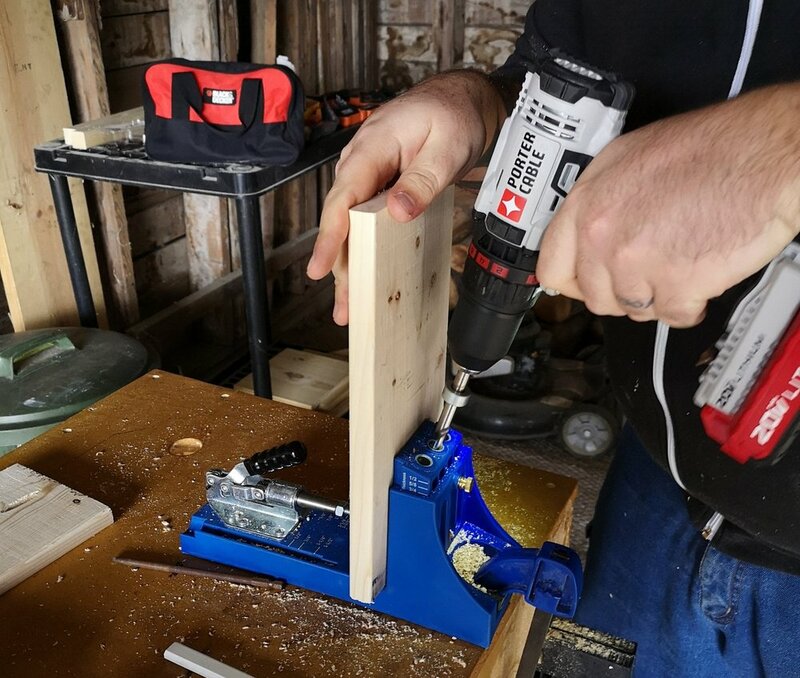 We used the Kreg Jig again to drill pocket holes into the two outside pieces, then using our 1 ¼” screws to attach the two outside pieces into the middle piece. Place the top on your work space, then take your upside-down nightstand and place it on top of the top, ensuring even spacing overhangs the frame. 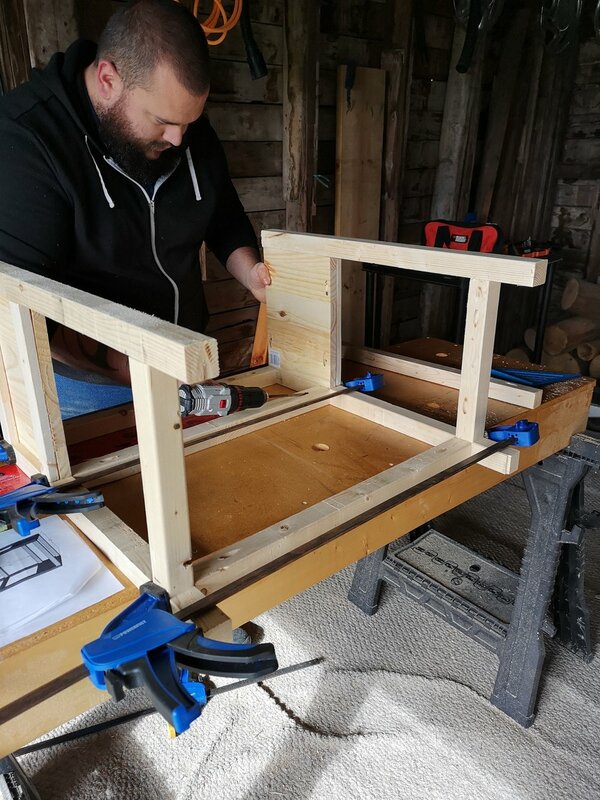 Then we drilled two pilot holes per top support and attached the top to the supports using 1” screws (we weren’t sure if this would be long enough as the directions had called for 1 ¼”, but we felt the longer screws would have poked through the top. Also, I ended up carrying them down a flight of stairs by hanging on to the overhang of the top, and it was solid, so the 1” screws worked well). Drilling the pocket holes into the short sides of the drawer. Make sure the side is clamped square to the long piece of the drawer before tightening the screw. Second short piece attachment, ensuring it is clamped and square to get a snug fit. Get your glue and spread glue evenly on all 4 sides of the 1x12 piece and slide it into the assembled drawer sides. Put the remaining side piece in place and clamp together so it all fits nice and tight and the glue can adhere. Install the final two pocket hole screws to assemble the sides. Putting the final pocket holes in. We used our Dewalt drill attachment to get into the corners easier. The drawer all clamped up and waiting for glue to set. 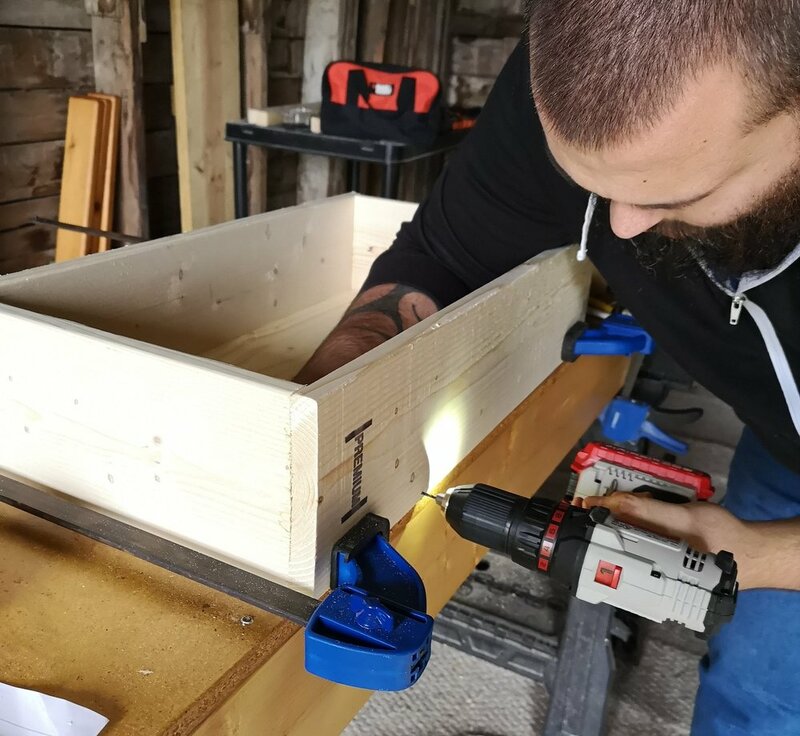 We then drilled pilot holes and installed 1” screws along the bottom of the sides and back of the drawer to ensure the bottom would not fall out. Following that, we put stainable wood filler along the joints on the inside and if necessary on the outside to make it look like one cohesive piece (we did this as the minor cupping in the 1x6 pieces left some spots that we were not happy with, so we filled them in to make everything look how we wanted). We let the drawer sit in the clamps for half an hour to give the glue time to set up. Drilling the pilot holes in the back of the drawer to ensure the bottom stays in place. The stainable wood filler we used. Now, this next step was the most frustrating the first time around, but we got smart the second time around, so we will share this with you. To install the drawer slides you will need 2 1x2 pieces cut to 11 ½” long. We started by clamping them at the same level as the bottom of the side panels. You may think this will be their final resting place, but it is not, so do not drill them in just yet. After you have them clamped in position, take your drawer out of its clamps and place into the nightstand. You will notice a rather large and unattractive gap between the drawer and the top of the nightstand. The directions said to leave about an 1/8” gap, but how to do that and ensure its level all why trying to adjust the drawer slides? I remember seeing someone on Instagram posting this tip, but I am not quite sure who it was, so if it was you, let us know because it is a time saver! We did not have playing cards accessible, but we took some old business cards and counted out two even stacks (we used 9). We placed a stack on top of the drawer on either side of the nightstand and used these stacks as spacers to ensure an even gap. We un-clamped one side, adjusted and re-clamped. We then drilled pilot holes and attached with 1 ¼” screws. Repeat on the other side. Initial clamping to start determining where the drawer slides must sit. After the drawer slides are clamped in place, card stacks used to ensure even spacing of the drawer and the drawer slides were adjusted to the proper height. Drilling the pilot holes to attach the drawer slides to the side after the proper height was determined. To install the trim on the bottom of the drawer, we took 1 2x2 at 23” and drilled a pocket hole in either end. We used the two stacks of cards again to get an even gap that matched the top gap, clamped the piece in place and then removed the drawer. Use 2 ½” screws to attach the piece. Drilling the screw into the bottom trim piece after determining the correct spacing using the card stacks. Finally, we are at the bottom shelf. First thing is to install the final 2x2 that is 23” in length. This should be installed so it is at the same level as the others, 3” from the bottom. Drill one pocket hole on each end and attach to the legs with 2 ½” screws. We then took the two 1x2 pieces that were also 23” in length and put glue on the bottoms and inside edges. Place these on top of the 2x2s. Take the final 1x12 piece that is 26” long and place in between the 1x2s. We clamped these pieces together and down to the 2x2s and let is sit for half an hour. Clamping the pieces of the bottom shelf together after applying glue. Now the build is complete! We sanded everything down with our orbital sander, including the inside of the nightstand and the drawer. After this, you can apply stain or paint in your choice of colour. Make sure to follow the directions on the can. Finish with a clear coat, and you are done! We used Weather Wash stain in Pined and finished with their clear top coat. We found some drawer handles that we liked from Home Depot and installed them once everything had dried. Final products after the finishing process. The Weather Wash reacted differently to both nightstands making them one of a kind pieces!